I will not be blogging for awhile. I do apologize for not visiting everyone's blogs. I miss you guys and I hope to have your support when I come back. I am going through some personal things right now and this blog and my hobby has to take the back burner. Sorry. My friend is having Knee surgery on Monday. 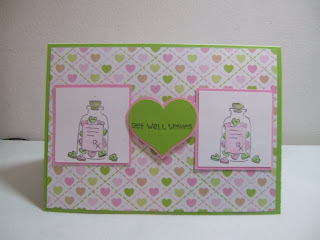 I made her this get well card. The card sketch is from SCS SC217. 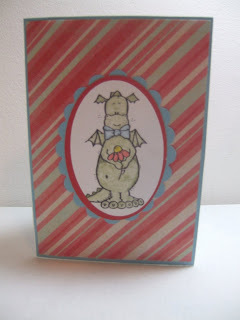 The paper is from the DCWV Spring Paper Stack and DCWV Spring Cardstock paper. 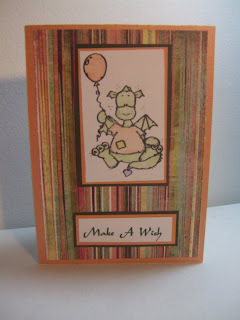 I made this card for another card for a friend who is going through a difficult time right now. I made her this Thinking of You card. 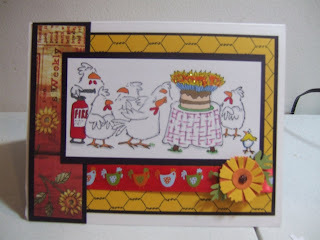 The paper from the DCWV Spring Paper Pack and DCWV Spring Cardstock Paper Pack. The scallop was cut out using the Storybook Cricut Cartridge. The image is from Lelo Flower Dragon. Sorry I haven't been blogging but I have been dealing with personal issues and a horrible cold that I still have. I treated to myself to some new stamps. I love these Dragons. They are from a stamp company called Lelo. They are so adorable. 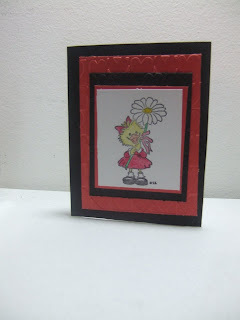 Paper is from Creating Keepsakes Confetti and Daisies. Paper is from DCWV Sweets paper stack. 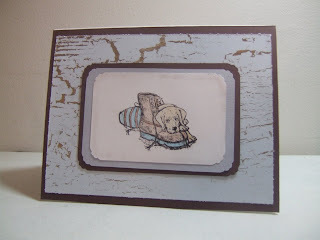 And the image is from Stampendous Tiers of Treats. If you click on the photo to enlarge it you will see that some of the cupcakes have fluff on them to make them looking like frosting. 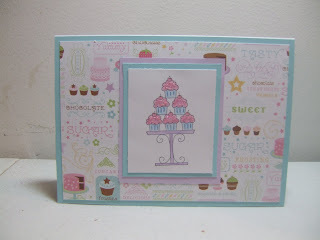 Paper is from DCWV Sweets paper pack. The cupcake image I received from WRAK on SCS. The oval was made using the cricut George Cartridge. 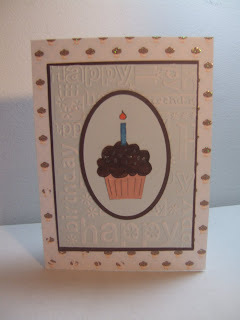 The Happy Birthday was embossed using the cuttlebug and Happy Birthday embossing folder. It's hard to see but I used stickles on the cupcake. The image was colored in with SU Markers. 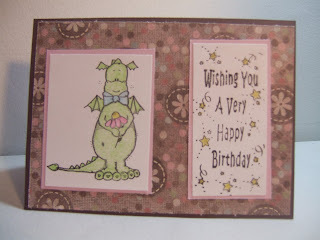 The next two cards use the Lelo Birthday Dragon stamp. I made one card for a boy and the other for a girl. The girl card is my favorite though. The saying Make A Wish was done on the computer using the Aladdin font. I was tagged by the talented Melanie and Kimmy. This is a fun tag! This is my friend Jay. 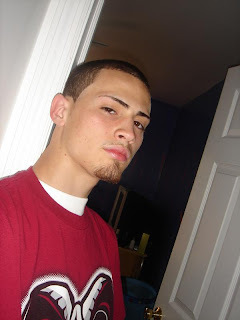 I met him through my sister Kayla, who is friends with his younger sister Carrie (they go to school together). Jay and I first started talking because I have a laptop that I was hoping he could fix but it's a problem with the mother board. Our friendship kind of went from there. Jay has a problem where he feels that he must tell me "everything" and I can't stress enough everything. Sometimes I have to question why are you telling me this. LOL! I have to tag 6 people. Everyone I know has been tagged so I am going to tag 2 people (they probably won't play along anyways but we'll give it a try). 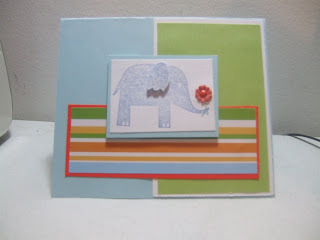 My friend has a fascination with elephants so I made this card. I like the layout of this card, I saw the layout somewhere (I believe possibly on SCS I will try to find it). This is another stamp that I have had for awhile but never used (SU Wild for you). 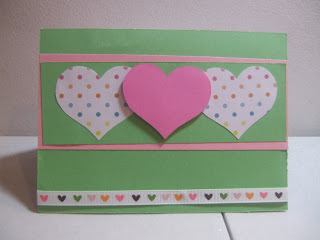 This is a little Valentine card. I had this Suzy Zoo stamp for awhile and I have neglected it. 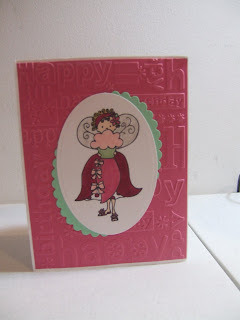 The cardstock was ran through the cuttlebug using the hearts embossing folder. 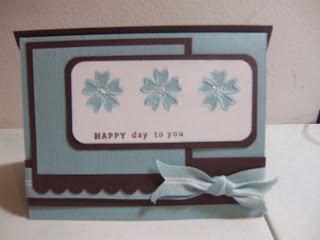 I love embossing with the cuttlebug. 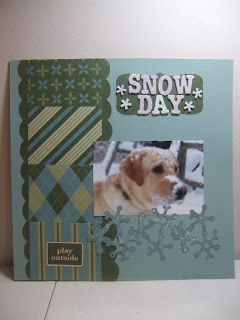 I made this card for the Stamps, Scraps n More challenge - to make a Riley card. I received this Riley image from SCS WishRak. 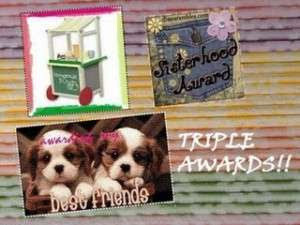 I recieved this sweet award from Diana today. She is so thoughtful, I am so glad that our paths have crossed. She is truely an amazing person. Welcome to Sunday Scrappin! I have been a bad blogger, I have been creating things but not posting (I am so sorry). This is what the 2 pages look together. The scallop edge is a little off because I made those by hand. Note to self need to invest in a scallop punch. I ordered the DCWV Sweets Paper pack and it finally arrived. I love the paper in that pack!! 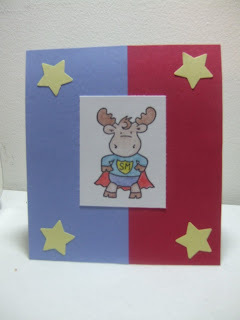 I waited and waited for the order to arrive so I could make a card and when it arrived I had a hard time using the papers because they are so cute (ever have that problem ?) 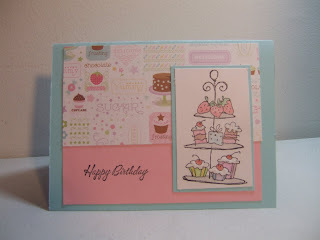 The image is from SCS Wishrak group it's from SU Crazy for Cupcakes set. PS. The week before Sunday Scrappin Challenge was to try a new technique. I tried paper quilling (tutorial can be seen here). I had the supplies for the longest time and I finally made a little heart. The batteries are charging in my camera I will take a picture later. 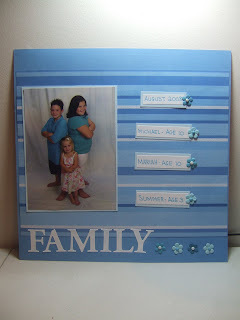 Next weeks Sunday Scrappin Challenge is to beat those winter blues by using the color blue as your main color! **Sorry for the poor quality picture but there isn't much light here (a snow storm is moving in). You can click on the photo to enlarge it). My friend Forgetfulone invited me to join 52 Sketches 52 Weeks. 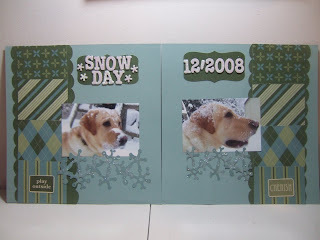 I would love to do 52 scrapbook layouts this year, that would be great. 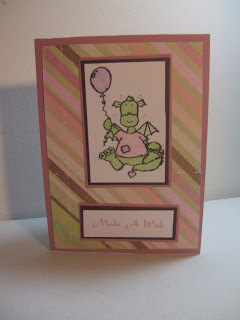 I make more cards then scrapbooks, it's not due to lack of pictures that's for sure. This first sketch was a challenge for me. I'm not a one picture layout person LOL I like to put several pictures on a page. Secondly, I never journal in my own handwriting, but being that my printer would not corporate with me today I had no choice. The ribbon the bottom of the card inspired this card idea. I think I may make another one using this style but different colors. Now that the holidays are over it's time to get back into the swing of things. I have been busy with the holidays that I haven't done Sunday Scrappin the past few weeks, but it feels great to be back. Made 2 Valentine Cards (I usually only hand out 2 cards one to my sister and one to Jeff *note yes Carrie Ba-Darry I will make one for you this year too) but I have lots of Valentine card ideas this year so I may get them done and have on hand to use for other occasions ie. anniversary, just because etc. 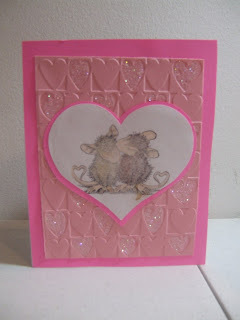 Challenges: Last weeks challenge was to use something from your stash and the 2 valentine cards that I made everything (with the exception of the chipboard heart on the one card) came from my stash. This weeks challenge is to Try a new technique... use a new supply... whatever you'd like, but do something that's new for you. Today my mailbox was filled with wonderful birthday cards. Thank you so much ladies for the wonderful cards, it brighted my day! 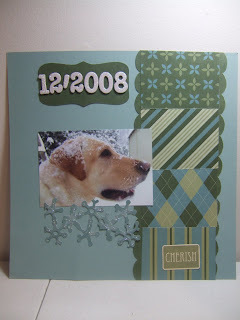 It is so nice to be able to make something besides a Christmas/winter theme card. I love the Whiff Joy stamps. I received this image from WishRak. The paper is Basic Grey Wassail Paper. The heart in the bottom right is a Vintage Wood Shape by Lil Davis Designs (got a package of 27 shapes for $.50 at AcMoore today). When I original set out to make this card I had the card idea in my head for Jeff but all pink does not scream male valentine to me. LOL! 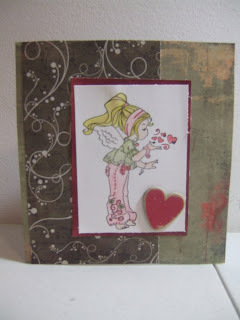 Used the cuttlebug heart embossing folder and then went over some of the hearts with SU dazzling diamonds.